Air quality in the Beijing region was better in November than any previous winter month on record, data shows. It comes after the government started a major shutdown of cement and steel plants, in a bid to fend off winter pollution episodes. The government also restricted small scale coal burning in 28 cities in provinces surrounding Beijing. But problems implementing the transition away from coal-based heating have left many people in the regions without heating, cooking facilities or hot water in sub zero temperatures. Levels of the particulate pollutant PM2.5 fell by 54% in Beijing in November compared to one year ago. It is the largest year-on-year drop on record for any month. PM2.5 levels across the entire region fell by 37%, dropping to an average of 67 µg/m3, compared to 108 µg/m3 in November last year. Heavy coal burning regions around the capital have also seen the largest fall on record in sulphur dioxide (SO2) emissions, Greenpeace analysis of satellite data and air quality measurement data shows. 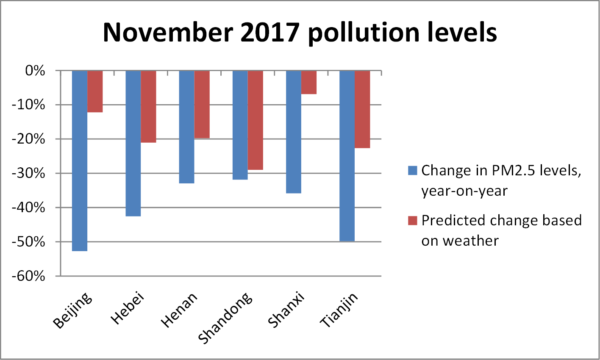 But some industrial cities saw pollution levels rise right until the winter measures went into full effect in November and consequently their October-November averages still fell short of their pollution reduction targets for the whole winter. In October, the government started a new plan designed to cut winter levels of particulate (PM) pollution by 15%, compared to the previous year. It targets major cities near Beijijng and coal burning areas further afield. Cement plants have been closed completely, while steel, aluminum and coking plants have had their operations restricted, typically to no more than 50% of capacity. Major construction projects have also been brought to a halt, cutting emissions and limiting demand for steel and cement. Government air pollution officials have carried out an unprecedented number of inspections, visiting 4,000 industrial plants. Teams found violations at 70% of the facilities they visited, and are holding local officials responsible for failing to enforce. Another programme targets households, with the aim of shifting 10 million households to electricity and gas for heating, cooking and hot water. As cold weather sets in, reports suggest that the shift away from coal has left some people without heat or hot water. Local governments in some areas have yet to install the networks and heaters required to shift millions of households and businesses from coal to electricity and gas. It also thought that a reliance on government orders rather than economic incentives and a focus on gas at the expense of other cleaner heating options, such as geothermal and heat pumps, combined with better insulation of houses, have contributed to the problem. In response, the environmental ministry has relaxed the coal bans, emphasizing that ensuring heating supply has to be the first priority. 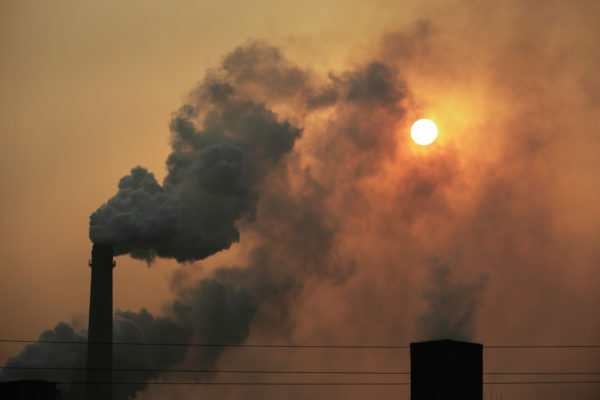 The government permitted areas without alternative heating installed to continue using coal, ordered the restart of mothballed coal-fired units at a Beijing power plant, and urged local governments to curtail gas supply to industrial users if needed to secure supplies for residential users. These emergency measures will provide relief to residents lacking heating, but are unlikely to increase coal-burning on a scale that would undermine the air quality gains. Meanwhile, the problems have already prompted a re-think of the high reliance on gas. Experts interviewed by the Communist Party official newspaper, People’s Daily, called for more attention on house insulation and the use of other alternatives, such as geothermal and heat pumps. Levels of SO2 – a major contributor to the region’s deadly particulate pollution – have seen historic drops over the last month. 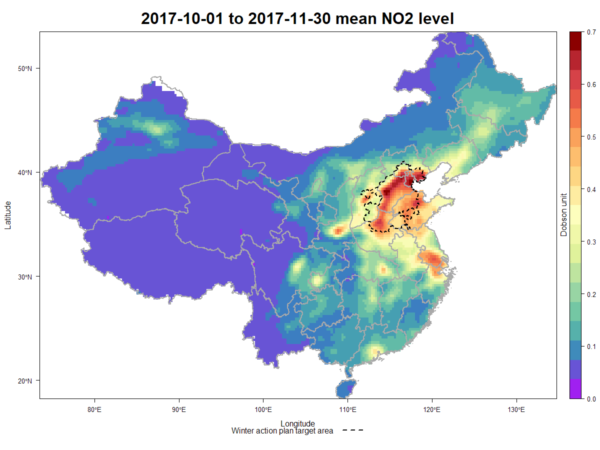 Satellite measured SO2 levels fell over 50% in the Beijing region compared with the same time last year. NO2 levels fell 10% in Hebei province, which is home to the largest steel industry in the world. The infamously smoggy steel city of Tangshan saw a 15% drop. SO2 and NO2 are key pollutants contributing to the deadly winter smog in the region, while NO2 is a good indicator of fossil fuel consumption in general. Despite the progress, the data shows a spike in NO2 pollution in the areas outside the capital, suggesting a spillover of industrial activity. But this may well lessen off as the construction bans take a toll on demand – road and water management projects have been stopped across the region while Beijing and Tianjin have banned all kinds of major construction. Stronger northern winds and lower humidity in November meant that PM2.5 levels would have fallen around 20% compared to last year anyway. However PM2.5 levels actually fell by almost 40%, accounted for by the measures in the winter action plan. But the region around Beijing remains an enormous hotspot of emissions. Two weeks ago, Beijing’s air pollution reached “hazardous” levels as winter smog fell on the capital. And the real test for the plan will come in the December to February period, when China tends to be hit by its most toxic smog episodes.